KIEV, Ukraine -- War-scarred Ukraine was engulfed Monday by a scandal involving the chiefs of its two main domestic security agencies amid claims of criminal dealings with top Russian tycoons. The fire at an oil-storage facility in the village of Kryachki, some 30 kms from Kiev on June 10, 2015. The standoff -- sparked by who was to blame for a massive oil complex fire that is still raging -- pits the head of Ukraine's State Security Service (SBU) against a national prosecutor with the power to order the arrest of anyone except the most senior government figures. It has also drawn in President Petro Poroshenko and involves Russia's largest petrochemical holding company -- part-owned by a close associate of President Vladimir Putin who has been blacklisted by the United States. 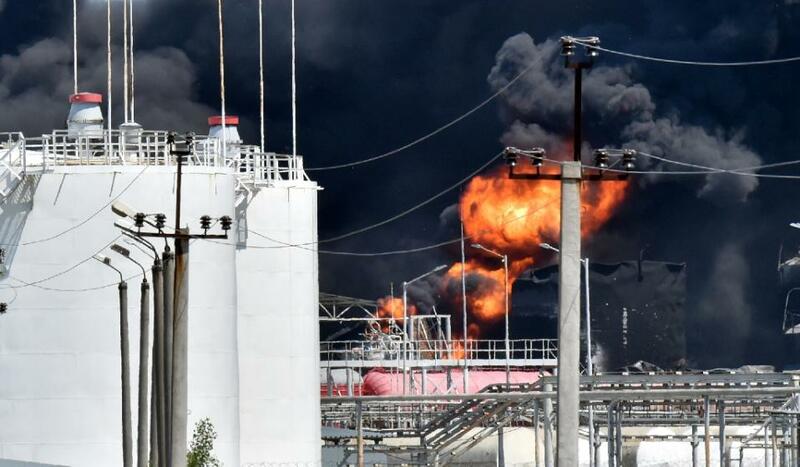 The bad blood brewing between Ukraine's prosecutors and security agents boiled over when a chain of June 8 explosions at a petrol complex near Kiev caused flames to shoot up. The fire was still burning on Monday afternoon. Rainstorms forecast this week are expected to douse one of the region's worst fires in decades. But the political ramifications of the disaster -- in which five people died -- are only now starting to emerge. SBU chief Valentyn Nalyvaychenko and some industry experts suspect that the complex -- owned by a large Ukrainian petrol chain called BRSM-Nafta -- is at the heart of an underground refining business that makes cheap but dangerous products on site. He claimed to have firm evidence of a former deputy general prosector illegally owning the Ukrainian company involved in the complex through offshore firms. Nalyvaychenko further accused the management of part of Russia's energy giant Sibur of providing "criminal protection" for the entire operation and also profiting from the illegal deals. The charges prompted the general prosecutor's office to denounce Nalyvaychenko's comments as slander and order him to appear for questioning Monday -- a decision backed by Poroshenko. The Ukrainian leader cancelled Nalyvaychenko's June 16 visit to Washington and ordered his deputy to go in his place. The complicated and secretive schemes allegedly being used by BRSM-Nafta saw consumers end up with low-grade fuel products and the owners walk away with huge untaxed profits. Analysts suspect BRSM-Nafta of carrying out unsupervised oil refining operations that should only be performed at state regulated -- and remote -- petrochemical plants specifically built for the purpose. "It is no secret to anyone in the oil market that BRSM-Nafta facilities are a breeding ground for home-spun products," said Sergiy Kuyun of the A95 energy consultancy. "These are not factories -- these are just facilities used to mix various components, all of them fairly toxic. Their improper (handling) and at the wrong temperature... can cause an explosion and lead to the fire we saw," he claimed. Such speculation has dominated Ukrainian television coverage of the fire and its still unexplained causes. But BRSM-Nafta blamed has firmly denied operating illegal refineries. Company spokesman Oleksandr Melnychuk told AFP that three explosive devices had been discovered near the company's storage tankers since last August. He called it a part of a mafia-style shakedown "to take BRSM-Nafta away from us." Ukraine's last attempt to sweep out corruption and align the post-Soviet nation with Europe in the wake of the 2004 pro-democracy Orange Revolution quickly faded and saw a clique of new oligarchs emerge. Many blamed the problem on political turf battles that drained attention away from economic growth measures and saw the enthusiastic pro-Western public grow disenchanted. But some Kiev analysts called Nalyvaychenko's charges -- and the media's extensive coverage of the entire case -- actually good for Ukraine. "In my opinion, this conflict will only benefit us," said political analyst Volodymyr Fesenko. "If they all end up jailing each other, there will be fewer corruption people in charge," he said. Political studies professor Oleksiy Haran added that Ukraine's powerful security agencies had successfully fought off all previous efforts to institute some form of state oversight and control. "They remain completely unreformed," said Haran. "Now, we have reached the start of a long road (toward oversight), And most often, the biggest problems emerge at the start."